Ameen Kazerouni moved from Mumbai, India to start his Bachelors in Computer Science at 16. After developing a keen interest in both AI and Medicine he proceeded to start his Ph.D. in Biomedical Informatics at Emory University. His research covered wrangling data from Whole Slide Images, pathology reports and clinical data to build datasets for cohort discovery and analysis. During his tenure at Emory, he decided to do a short internship at Zappos to see what life was like outside the ivory tower. He decided to leave the Ph.D. program early, earning a Masters in Computer Science with a focus in Machine Learning. 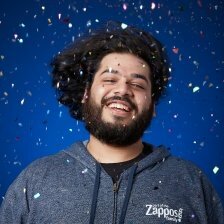 Ameen currently leads the Data Science and Machine Learning platform team at Zappos, where he uses his passion for machine learning and AI to find new and innovative ways to move the company forward using data. Panel: AI in retail and ecommerce.